She graduated from Dental Surgery at the Autonomous University of Baja California. Then, she took the Endodontics specialty at the Dental Specialties in the University of Baja California. She has also participated in national and international conferences, such as the National Endodontic Congress in Los Cabos, the Annual Endo-Baja Reunion and the AEDE-Claide Congress in Madrid, Spain. 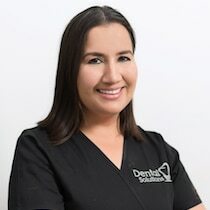 After acquiring eight years of experience working in one of the largest clinics in Los Algodones, mainly seeing patients from the United States and Canada, she joined the Dental Solutions family project Algodones to work in root canals treatments, dentures, crowns, bridges and extractions.